If you know me, or if you read this blog with any regularity, you know I'm not a big sci-fi/fantasy fan. 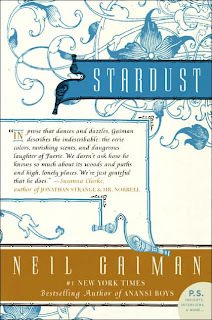 Still, Neil Gaiman's Stardust has gotten so much press, I knew I had to read it. And, guess what? I LOVED it. I mean, I liked Gaiman's Anansi Boys, but Stardust made me worship this writer on a whole new level. The book stars Tristran Thorn, a young man living in the walled city of Wall. At one end of his city is a hole, through which lies the land of Fairie. This opening in the wall is guarded every night by men who are charged with allowing no one passage through the hole. Like all residents of Wall, Tristran has observed strange shadows lurking on the Fairie side, but he has never had any real desire to cross the boundary. At least, not until one fateful night, when he accompanies the beautiful Victoria Forester home and the pair see a falling star. Teasingly, Victoria promises that she will marry Tristran if he brings her the star that has fallen. Hopeful, the boy sets out on a journey that takes him beyond his home to the strange land of Fairie, a place where magic abounds and nothing is as it seems. Here, a fallen star does not resemble a "diamond or a rock"(109) like Tristran expects; instead, he finds himself dragging an ethereal young lady back to his city. Soon, Tristran discovers that he is not the only one seeking the star - there's a power-hungry lord searching for its power; an evil hag intent on removing its heart and any number of creatures willing to do harm to Tristran and his prize. Confronting the many dangers in the strange - but oddly familiar - land requires all of Tristan's strength and wit. It also forces him to face the truth of his birth, his heritage and his heart. This "fairy tale for adults" is simple and enchanting. It lacks the depth of some classic stories, but it captures the imagination as aptly as anything written by C.S. Lewis or J.R.R. Tolkien. Gaiman writes exceptionally well - his word choice is always apt, always laced with his trademark wit. He sculpts his characters with care, creating a memorable cast of various creatures. Tristran makes a likable, if unlikely, hero, who captured my heart with his humility and goodness. 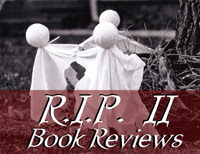 I loved Yvain - the fallen star - as well, and thought her character unique and interesting. Mostly, I loved this story because it is saturated with heart. Despite dark spots, Stardust is essentially a warm tale about one boy's quest to find adventure, love and, ultimately, himself. Note: I stuck this book on my list for the R.I.P. Challenge, knowing only that it had something to do with magic. It probably wasn't the best read (theme-wise) for this challenge, but I'm not apologizing since I loved the book so much and I wouldn't have gotten to it this year if I hadn't put it on my R.I.P. list. So there! I read Stardust quite recently. Actually for Carl's previous challenge :) And really enjoyed it. As you say it is fairly simplistic, but at the same time the language is wonderful and the land of Faerie is fantastic. Have you seen the movie? I just saw it on on Saturday, and I was very impressed. The same goodness that made the book so special was really captured in the film.